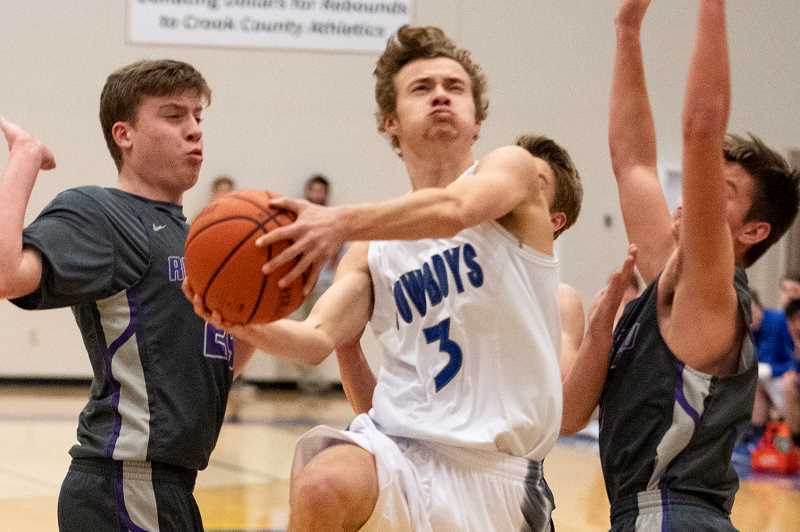 The Crook County Cowboys broke open a close game with a surge that started late in the second quarter and continued into the third as they rolled to a 60-35 victory over Ridgeview in Intermountain conference boys basketball play. The Cowboys were hot early in the contest and extended their lead to 17-9 on Shane Kessi's second three-pointer of the first quarter. "This was very important," said Kessi. "I think this was our turn around game for sure. That was the first time for a while that we have come out strong at the start of the game and the start of the third quarter in a long time. It was important to get everyone confident, and we just know that we can rely on our bench. Our teammates played great. It was a fun win." Just when it looked like the Cowboys were going to put the game away, the Ravens made a charge of their own, cutting the Cowboy lead to just four points at 22-18 late in the first half. 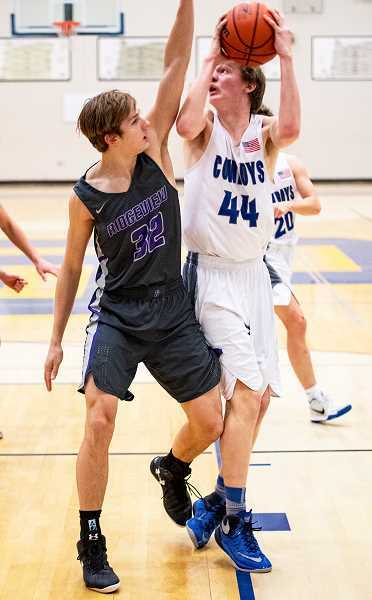 After a Crook County time out, the Cowboys scored the final seven points of the period, closing out the half on a three pointer by Hunter Bishop. Crook County continued to roll in the third quarter, outscoring the Ravens 24-7 in the period as they extended their lead to 51-25. With the Cowboys leading by more than 20 points, both teams went to their bench in the fourth quarter as Crook County cruised to the easy win. Kaleb Savage led the Cowboys in scoring with 13, while Kessi and Jesse Sanchez both finished with 11 points. Jordan Graydon pitched in with eight points for the Cowboys. "I think that our defense was really solid, and we were able to establish in the half court," Graydon said. "And we were able to do things the way we want to do them. Being patient on offense and being able to execute is one of the most important parts of our game." The Cowboys did much of their damage from long range, knocking down 10 threes in the contest. Nolan Conroyd led the Ravens with 10 points, while Caleb Carpenter added eight points, and Kevin Edmondson scored seven. The win broke a three-game losing streak for the Cowboys, who improved to 1-2 in Intermountain Conference play and 9-8 overall. Meanwhile, the Ravens fell to 0-3 in conference play and 1-15 overall. "Hey, that's what it feels like to get a win at home," an elated Crook County head coach, Darin Kessi, said. "I think we knew that they were going to play hard. They made a pretty decent run in the second quarter, and then I think that we kept our poise and we were able to stretch it out because we had some good offense. We were able to pass the ball and then we made some good shots. A lot of the threes we made there were inside-out threes, and we were able to knock those down. Then in the third quarter, I think that we stepped up our full-court pressure and that hurt them." Crook County is back in action on Friday, Feb. 1, when they go on the road to take on league-leading Hood River Valley (3-0, 9-6), while Ridgeview hosts South Albany (14-2) on Tuesday in a non-league matchup. Both games are scheduled for 6:30 p.m.
Ridgeview – Nolan Conroyd 10, Carpenter 8, Edmondson 7, Davis 4, Johnson 2, Sheldon 2, Demars 2. Totals 14 6-14 35. Crook County – Kaleb Savage 13, Kessi 11, J. Sanchez 11, Graydon 8, Bishop 6, Lowenbach 3, Mullan 2, Chaney 2, K. Sanchez 2, Arnold 1, Smith 1, Ramirez, Humeston. Totals: 16 16-26 60. Three-point goals – Ridgeview: Edmondson. Crook County: Kessi 3, Savage 3, Bishop 2, J. Sanchez 2.